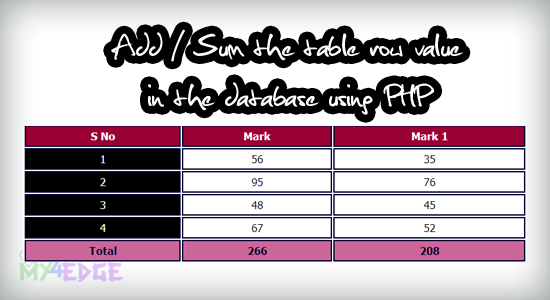 Here i'm going to tell about, how to make addition or sum the table row values in the mysql database using PHP, this concept is very simple one, let see how to make this addition in mysql database using PHP. you know this, like the above sample image is the demo of the add or sum the database data values in the database using PHP, you can see the out put value in the last row the table. ok let see the code. i hope you can get clear idea from the above code. SUM(column-name) is very important. i hope this is very useful to everyone. Thank you. thats great solution. Thanks a lot. God Bless U.